The treble crochet stitch is an important basic crochet stitch that you're likely to need for working various crochet patterns. It is also called triple crochet. It is similar to a double crochet stitch, but slightly taller in height. Like every other basic stitch, trebles can be combined with other stitches to make interesting stitch patterns. They can be used in a variety of different ways and worked into many different configurations, including rows, squares, circles, triangles, and other shapes. In this tutorial, you'll first learn how to work a treble crochet stitch. Then you'll also learn how to work treble crochet in rows. Note that this is a right-handed crochet pattern. If you are left-handed, you will reverse the direction to work from left to right across the rows. See also: crocheting left-handed. Treble crochet is a basic crochet stitch. It is worked almost the same way as a double crochet stitch. However, you will yarn over an extra time at the beginning, which allows you to create a stitch that is slightly taller than double crochet. 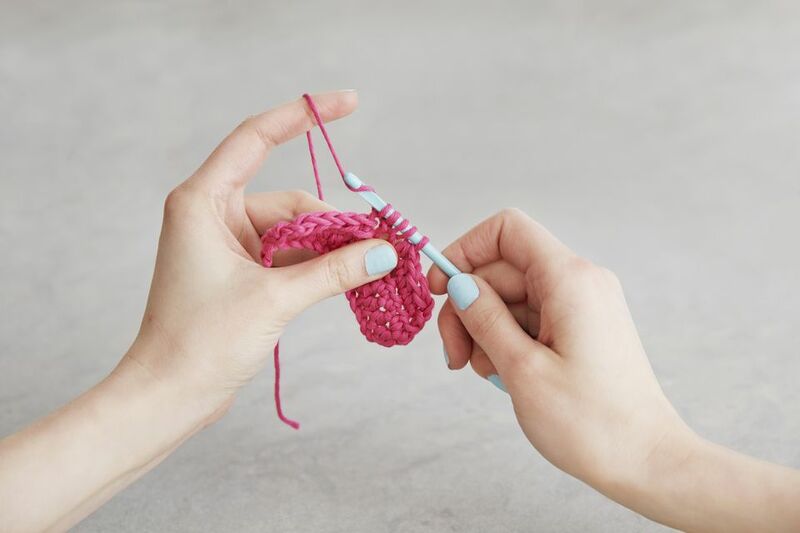 If you already know the difference between single crochet and double crochet then you will understand the similar difference between double crochet and treble crochet. You can work treble crochet in almost any yarn or crochet thread. It can be worked in rows or in rounds. Begin by crocheting a starting chain. Remember how to work a chain stitch? (If not, you are welcome to brush up using the tutorial linked.) To work the treble crochet stitch in rows, you'll begin the work by crocheting a series of chain stitches. Alternately, there are other ways you can get started; for example, you could crochet your treble stitches directly into fabric. Or you could work them into a piece that you've already begun. If that's what you want to do, you'll skip the starting chain and proceed working your treble crochet into the next stitch to be worked. The first four of your chain stitches will count as your first treble crochet stitch. When you crochet your next stitch, you'll want to work into the fifth chain from your crochet hook. You're going to skip the first four chains from your hook (since those count as the first treble crochet stitch); you'll insert your hook into the fifth chain stitch. In the photo at the left, you can see the head of the crochet hook right beside the spot where you will insert the hook to work the stitch. Here's how it will look after you've inserted your hook into the fifth chain stitch. This is just a continuation of the previous step. Next, grab the yarn with your hook. In other words, yarn over. Now, pull it through the chain stitch. Steps six and seven together are commonly called, "yarn over, pull through." 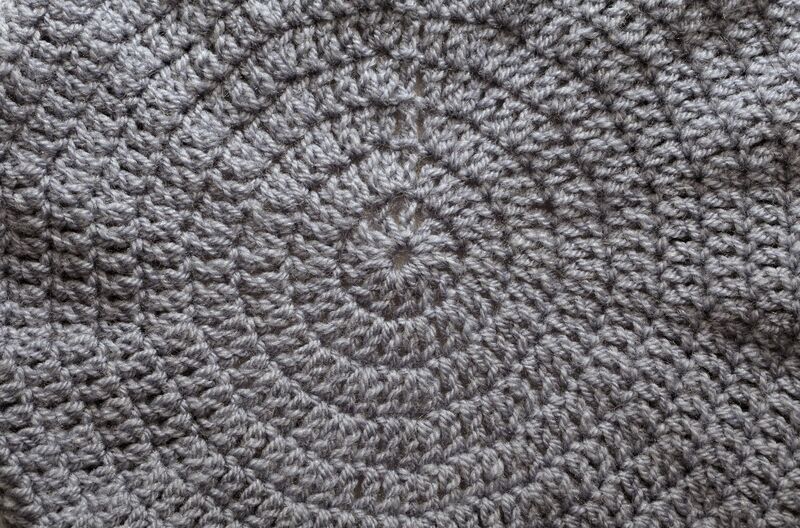 You'll end up with four loops on your crochet hook at this point in the work. Wrap the yarn around your hook again, repeating step six. and pull it through the first two of the loops on your hook. Note that you're only pulling through two loops, which you will be accustomed to doing if you have previously learned how to work a double crochet stitch. You'll end up with three loops left on the hook. As you'll notice, each time that you do the steps to complete the stitch, you will have one fewer loop on the hook then you did before. ...and pull it through the next 2 loops on the hook. In other words, repeat steps six and seven again. You'll be left with two loops still remaining on the crochet hook. You should be getting the hang of this stitch's construction by now. and pull it through the remaining two loops on your hook. In other words, complete the stitch by repeating steps six and seven one final time. Here's how the completed treble crochet stitch looks. Notice that you are down to having only one loop remaining on your hook. This is called your "active loop." You'll keep repeating the steps above, over and over again, to make one complete treble crochet stitch in each of the chain stitches in your starting chain. When you've crocheted across the entire row, here's how the completed row of treble crochet stitches might look. The next step is to work your turning chain. The turning chain for a treble crochet stitch is usually 4 stitches, meaning that you will work 4 chain stitches in between each of your rows of treble crochet stitch. This number of chains isn't set in stone; it's simply a suggested number of chain stitches that works well for a majority of crocheters under ordinary circumstances. There might be plenty of reasons why you'd want to work a longer or shorter turning chain, and you should feel free to do so if you like. Of course, if your crochet pattern indicates that you should use a different number for the starting chain, then you should follow the pattern's instructions. The next step is to work back across the row of treble crochet stitches, building your new row on top of the old row of stitches. To accomplish this goal, you'll have to turn your work over to the other side. It'll look something like the picture posted at left. You'll work another treble crochet stitch into the top of the stitch you worked in the previous row. Wrap the yarn around the hook twice, insert your hook under both loops of the stitch underneath it in the previous row, wrap your yarn around again, pull it through, and then keep pulling loops through two at a time until your stitch is completed. From here on out, you can just keep repeating those steps ad infinitum until the piece is as long as you want it to be. Of course, as with other basic crochet stitches, you can work treble crochet into one loop only (front loop or back loop) to achieve different design effects. If your crochet pattern doesn't state otherwise then you will work through both loops. When you are finished, end off by cutting the yarn (leaving a long tail for weaving ends in.) Then pull the cut tail of yarn through the active loop and give it a good tug. Then you can weave your ends in if you like. At left, you can feast your eyes on a photo of the finished treble crochet stitch fabric.